How big is the world’s largest engine? 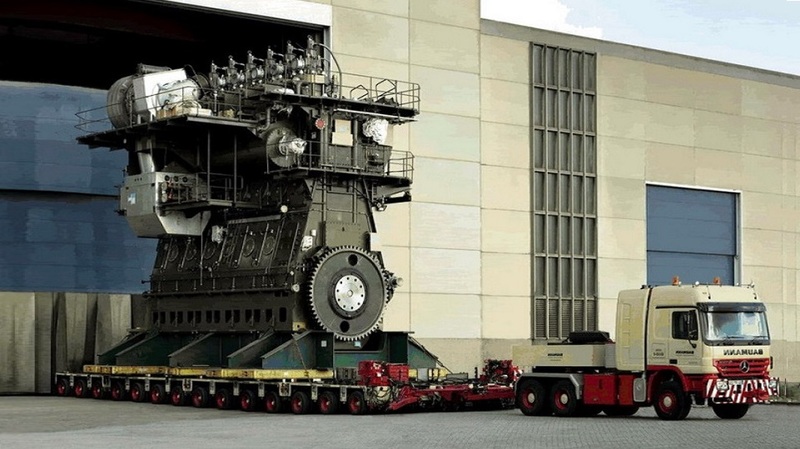 The world’s largest engine has 109,000 horsepower, and it’s a ship engine, a Wartsila RTA96C-14, and it powers one of the largest container ships in operation. Compare that with the Titanic, which had an engine capable of 15,000 horsepower. The ship is called the Emma Maersk, and yes, it requires 109,000 horses to move it through the water. The Wartsill-Sulzer engine is one of 25 14-cylendar turbocharged diesel 2-stroke engines in use currently. It’s weight is 2,100 metric tons. Tons! It’s as tall as a small apartment building at 14 meters and it’s 28 meters long. Limit? 102 RPM. What could you and what couldn’t you move with this engine? Top speed of a container ship like the Emma Maersk with this motor? 31 knots (57 km/h). Fuel consumption? 6.5 ounces of diesel per cycle. Energy output? 80,000 KW. How much power does your city require to keep it’s lights on? Well, there are 86 more of these world’s largest engines on the way, and there are larger and more powerful engines being planned in various locations.